Since Microsoft has completely ended all support for Windows XP, there have not been any updates to the operating system to improve compatibility with older applications. 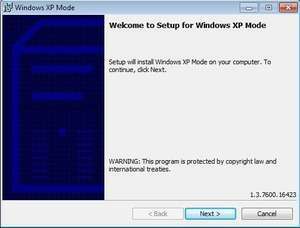 With Windows XP Mode, you can run Windows XP applications without having to upgrade your software. This can be especially useful if the programs you want to use have not been changed to support Windows 7, Windows 8 or Windows 10. The program works similar to a virtual system and allows for the emulation of a Windows XP system on your newer Windows desktop. Version 1.3.7600.16432 is a freeware program which does not have restrictions and it's free so it doesn't cost anything. For security reasons, you should also check out the Windows XP Mode download at LO4D.com which includes virus and malware tests. Additional screenshots of this application download may be available, too. Windows XP Mode download been highly rated by our users.